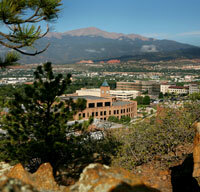 Located at the base of Pikes Peak along the southern Rocky Mountains, the University of Colorado at Colorado Springs (UCCS) is host to 12,000 students. Founded in 1965, UCCS has a campus covering over 500 acres, with buildings as diverse as Main Hall, which dates back to 1914, to the 87,000 square foot Beth-El College of Nursing. UCCS had several goals for the project, each requiring a special set of circumstances. One building called for the replacement of an old DDC system, another needed a partial replacement of an old data management system. Modems needed to be replaced with a campus wide network; software was upgraded. At the same time a new Web server and historian was installed. In addition, the school added electrical meter tracking for all the buildings in order to monitor when peak usage was occurring. Equally important was to be able to complete the project with available funding. Setpoint provided UCCS with several package options so the school could choose which solution worked best for its needs and budget. A BACnet system integrated different existing systems as well as the new network, HVAC and electrical meter reading and trending. The University Center went from a pneumatic system to DDC. Setpoint worked with the UCCS IT department to program the system to fit the school’s specific requirements. Says Ralph Henline, HVAC Technician, “Setpoint was great in causing as little disruption as possible while the system was being installed. The Delta system has helped make it easier to improve occupant comfort. For instance, in the Engineering Building, we have better temperature control. And no longer have to run chillers and boilers at the same time!” Mr. Henline was also quite impressed with Setpoint’s after service, pointing out that when a glitch arose with the firmware, Setpoint replaced the affected controllers at no charge. Since its inception, Delta Controls has taken a single approach to business: do what it takes to do the job right, all the time, every time. That’s why we offer the most interoperable BACnet platform in the industry. And designed our own HVAC, lighting and access systems to be fully integrated and operated from a single workstation. We pride ourselves on our easy-to-use graphic interface and customizable software. Simply put, we do it right. This entry was posted in Setpoint Systems News and tagged Building Automation System, Building Automation Systems, Colorado, Colorado Springs, Delta Controls, fac, facility management system, HVAC, Main Hall, Pikes Peak, setpoint systems coporation, UCCS, University of Colorado, University of Colorado Colorado Springs on November 8, 2013 by setpointsystems.